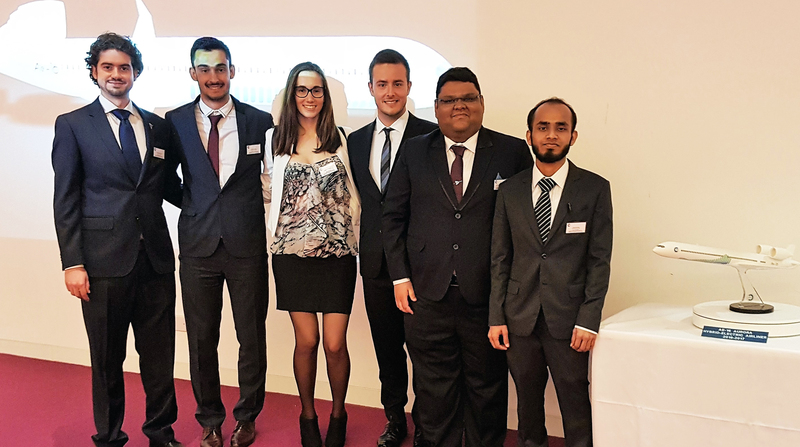 Cranfield University Blogs | Behind the scenes of the legendary Cranfield AVD group design project – what is it really like? I joined the Aerospace Vehicle Design MSc course in September 2016 and little did I know what was waiting for me. Our taught modules began in early October and soon we were introduced to the Group Design Project by our Professor. I still remember that day, it was a cold afternoon and we had the first GDP meeting in the Vincent Building Auditorium. Everyone including me was really excited to see what we are going to design. The feeling when you see the first view of the aircraft’s initial sketches (which was soon to be designed by us in detail!) is simply amazing. Our task as a team was to use the Conceptual Design and develop a detail design working in teams – Structures, Systems, and Avionics. Over 55 students and one aircraft, huh! I had an eye on the Structures team as that is my area of interest. I soon filled my three choices of the components I wanted to design and gave some reasons. I was happy I got my second option i.e. to Design a “Leading Edge Morphing High Lift Device” as my Primary Task and “Fatigue Load Spectrum Generation” as my Secondary Task. Most of us were happy with the component allocations. The first technical meeting was held soon and I was a part of the High Lift Device team which was a sub-group of the main Wing Design Team. In general, we were a diverse group comprising of people from different regions and people with mixed academic and professional background. For every project like ours, a team leader must be appointed, so we elected that person first. As GDP is a Virtual Industry Environment Project, it must run like that. The role of the team leader was to make sure each of us has tasks to do and made sure the deadlines are met along with his/her own task. Similarly, we had a Chief Engineer role, who was one of our professors and the person behind the conceptual design. The back-bone of this project was the famous ‘Blue Book’ – this contained all the relevant data and figures of the conceptual design which was used to develop the detailed design. Technical sessions were held every Tuesday to update the teaching staff of our progress and take some technical guidance wherever required. The teaching staff were very helpful and played an important role in the project. As said earlier, the Virtual Industry Environment Project, also contained a Project Monitoring Team – students in-charge of the project management of each group – Structures, Systems, and Avionics. Every Thursday they presented in front of all the students and teaching staff, to review the progress of each groups and discuss any critical issues, risks, note actions and decisions etc. Other groups which were part of the management team included Risk Register, Actions/Decisions, and an Interface Issues team. These roles and responsibilities gave the us a good realisation of what an industrial project is like. Other technical teams involved in this project were: Mass-Inertia-CG-Control, CAD, Physical Model Manufacture, and the Fatigue Spectrum team. Each of these teams had to present every week of their progress. We did not know that soon our happy faces are going to be little happier (or not!) The time had come for the Preliminary Design Review (PDR). This is where everyone needs to present in front of external academic and industrial representatives, to show their progress and future work. Soon our second home became the library and PC labs! Late night work was common for AVD students! In a group with mix of experiences, there were good times and bad times too but each of them added a diverse experience to our careers. There were times when there was a technical argument (or rather I should call it a technical discussion!) between teams which was quite well handled. Data and results began to fly among teams and we often required some data from other teams to progress. This made it more important for us to make sure we produced good results. I, along with others, had loads of interactions with people in different groups. This helped me to improve my interpersonal skills as well as my communications skills, both of which are vital skills that I will need to advance my career. I come from an industry background and I could relate all these with my past experience. PDR was over and we got some good feedback. One thing which kept us going was feedback from our teaching staff. Having the concept of the Formal Design Review integrated into the project ensures that industry practice is followed. As days passed, my laptop running time became 15 + hours a day! Meanwhile the analysis and hand calculations kept me and others busy in different PC labs. There were times when one could find a PC lab packed with AVD students: some energetic, some tired, some happy, some sleepy as well, all day any time! Each of us got chance to design our components in CATIA and then analyse in Patran/Nastran. Our FEM faculty was a great help to all the structures students. I am glad that I got an opportunity to sit with him and discuss my analysis. He sat with us students for a long time, just to make sure that every individual understands the points and he/she progresses well in their work. Our Course Director(s), along with the teaching staff, also guided and showed us the correct direction whenever required. We were also supported by a Post-Doctorate Research Fellow who was also an AVD alumni and knew what we were going through. Our Student Academic Support lead was fantastic and helped throughout the journey, even when she was on leave, she made sure that someone was there to address our issues, if there were any. I thank everyone for their support throughout! Finally, our Last Technical Meeting was over but we still had to submit the thesis. Each one of us became extra hard-working to complete the thesis. Some of the students submitted their thesis before time. The deadline was close. Just 48 hours before the deadline, I was not happy with some of my results, I went to the lab to do some new runs at around 02:00 AM and got some good results. I was happy, on my way back to my room I found my classmates near library – their eyes red and hair all messed up. Wow! Those were some challenging but exciting days. The outcome from the project was the detailed design of the component which was validated by carrying out a detailed analysis. The results was written in the form of technical reports, presentations and engineering drawings. I remember I didn’t sleep or even stop to eat for 40 hours before I submitted my thesis (I know this is not a good practice!) On the thesis submission day, the printing machines were busy, the library was busy – and one thing I learned from this was never ever keep work pending til the very last moment! On the day I submitted my thesis, I went and slept for 17 hours like a happy baby. After a few days of rest it was time to prepare the Critical Design Review (CDR). Everybody was waiting for it. The teaching staff selected few students to present. I was selected to speak about the Wing Structural Design. Each main presenter had a helping hand from another student to develop the presentation. I had to speak about 12 students’ work. I was happy and excited about the CDR. It was a good challenge to pull out information from different people. The main day came closer and we had lots and lots of practice sessions to make sure that our technical content was good, the presentation structure was sound, the speaking pace was proper, and we were confident while speaking. The big day finally came on 3rd May. Everyone was suited up and ready to present the project which was the hard work of all the students and teaching staff involved. My turn to speak came post-lunch and I presented. I felt confident, clear in my speech and crisp in the content. The applause and the claps after the presentation were satisfying. At the end of the CDR our CAD model video was shown. It was a good piece of work done by the video team. Their days and nights of effort paid off, kudos to them! Post CDR, we got chance to speak with industry and academic representatives to discuss about work and show them the posters displayed outside the auditorium. Yes, finally it was done, and I could see smiling faces all around me! To celebrate this moment, we all went to the Cranfield Student Association in our suits and spent some good time with friends. Overall it was a brilliant experience for me. I used my theoretical knowledge and applied it to a complex practical problem. I also made worldwide friendships along the way. This experience made me think of every problem as an engineering challenge and encouraged me to find a solution in a new way. This gave me positivity and strength to work hard and be innovative in my approach to engineering solutions. So, the Group Design Project is done but I still remember those days and miss them. I want to thank my family and each and every person from Cranfield University for their constant support and motivation – it was a once in a lifetime experience. Lovely piece I had a similar experience at the Air-Force Institute of Technology Kaduna, Nigeria. Group Design Projects always makes you a better person at the end. It’s sad I couldn’t get the funds to study for MSc at Cranfield University even after securing admission. I pray for a miracle someday, I am so happy and motivated reading this piece! My self k Sumanth Harshavardhan, looking forward to join in Cranfield University, for Design Engineer ( AVD ) I’m looking for an scholarship for this program can you help me out with this.